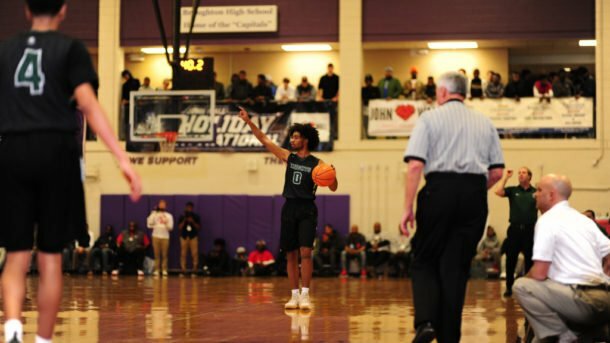 In 2004, Coby White was a pint-sized 3 year old whose Goldsboro, N.C., based family was proud that he could sink 2-footers in his Little Tike’s adjustable basketball goal. In the same year, 100 hundred miles northwest in Mebane, JamesOn Curry was scorching the nets at Eastern Alamance to the tune of 43 points per game in route to becoming the leading scorer in North Carolina high school basketball history with 3,307 career points. Curry’s reign ended Saturday afternoon. In a 74-68 loss to Northside (Roanoke, Va.) at the Rock the Ribbon Roundball Shootout in Lexington, Va., White scored 41 points to surpass Curry as the state’s top scorer, and land him on the American Family Insurance ALL-USA Watch List. White has officially scored 3,325 points with two regular season games still remaining. White sits atop a distinguished list of players which include David Thompson, James Worthy, Dominique Wilkins, and, yes, even Michael Jordan. This season, White has pumped in 32 points, eight assists and seven rebounds a game for the Knights. He broke the John Wall Holiday Invitational’s 27-year-old scoring record in December, scoring 119 points in three games, and was recently named to the McDonald’s All American Game, which tips on March 28. White, a North Carolina signee, was also named as 1 of 9 finalists for USA Today’s ALL-USA Player of the Year award. Curry was also originally signed to North Carolina, but had his scholarship rescinded after legal troubles. He went on to star at Oklahoma State before stints overseas, with the Chicago Bulls and the Los Angeles Clippers. White lost his father Donald to cancer on August 15. Shortly thereafter he dedicated the rest of his basketball career to him and set three goals: Become a McDonald’s All American, become the state’s all-time leading scorer and win a state title.